Just a quick note to remind everyone what they should be doing today…Celebrating all things John Thomas! That’s right, on this day, 28 years ago (yes, he’s a young’un! ), my husband made his grand debut. And for those of you who really know us, you know that we don’t take birthdays lightly. No siree bob, they’re a several-day affair, full of food, drinks, laughs and fun. And we wouldn’t have it any other way! You’ll have to wait ’til tomorrow’s post to hear all about our birthday weekend in Amsterdam, but since we’re talking birthday, I figured I could at least share some of John’s cakes- yes, plural!- with you! Last week, I asked John what type of cake he would choose if he could have anything his heart desired. He was at a loss to start with, so, being the Cake Junkie that I am (as you all know, cake is my WORLD), I started listing them off like it was my job. ‘Spice cake, Funfetti cake, chocolate cake, ice cream cake, apple pie, cheese cake (always John’s favorite)…’ I continued, ‘Something with fruit? Something with ice cream? Something with nuts?…’ So he thought long and hard for several minutes before choosing one that I hadn’t even mentioned, but definitely one of my alltime favs, especially this time of year…PUMPKIN CAKE. He continued, ‘And not a spicy pumpkin cake, but a true orangey-colored, pumpkiny cake. Oh, and no nuts in there. They mess up the flow.’ Now there’s a fella after my heart- I couldn’t have described the perfect pumpkin cake any better myself. 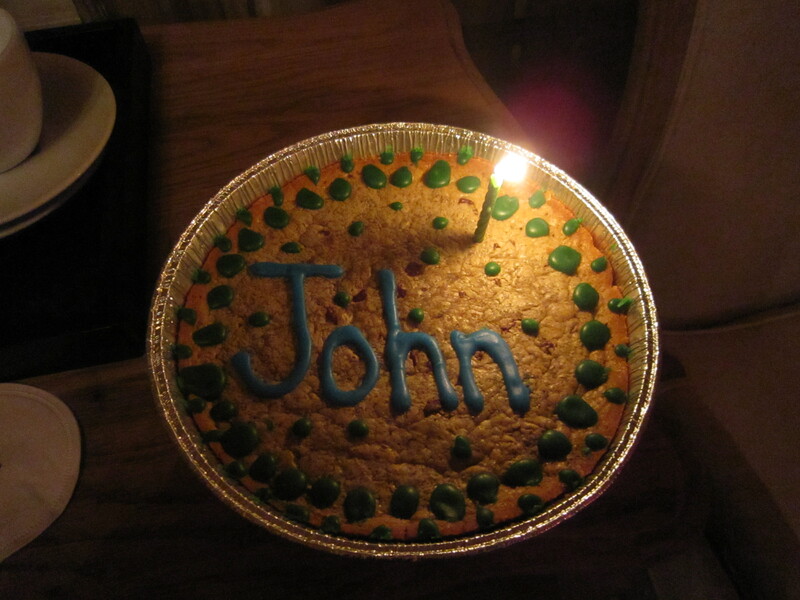 That afternoon, John walked in the door and announced, ‘You know what kind of birthday cake really sounds good? A giant cookie cake!’ ‘But what about the pumpkin cake?’ I ask. ‘Yeah, both of them sound perfect and now I can’t decide.’ So back to the computer I went (a giant cookie would be another new kitchen adventure), then back to the store the next morning to get more stuff…My thought was this: We’re heading to Amsterdam on Thursday for Birthday Weekend, so I’ll make the giant cookie to take with us. 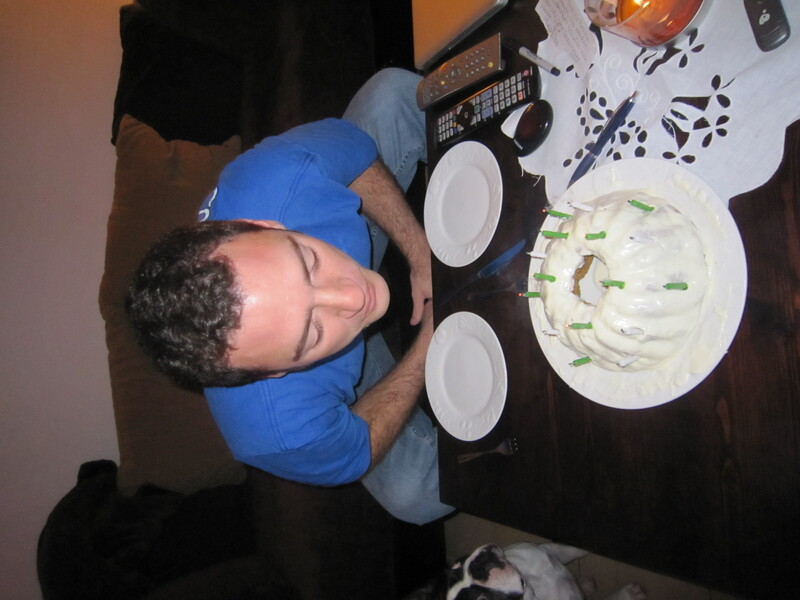 Then I can make the pumpkin cake Sunday night when we get ‘home’ for his actual birthday! See, there’s always a logical explanation for eating 2, possibly 3, cakes in just a few days! Ha! I decided to bake both pumpkin cakes on Sunday night. I figured that I had all the ingredients and its not like I can take them home with me in a few weeks, so I might as well! And I’m glad I did! And before you say it, yes, I screwed one up…But not the one I thought! That’s right, I screwed up the cake mix recipe! I was so worried about the made-from-scratch cake that I guess I got careless on the other one and read ‘1 can pumpkin’ rather than ‘1 cup pumpkin…’ *sigh* So my cake got a whopping 32 oz. of canned pumpkin rather than a measly 8 oz.! I didn’t catch the error until I tasted the batter once the cake was in baking- it just tasted mighty ‘pumpkiny!’ Needless to say, I REALLY felt the pressure as I put together the second cake! Overall, I consider both successes. No, the cake mix cake wasn’t my best culinary creation- it was like a thick, slabbish but kinda puffy, very moist pumpkin pie- but its flavor was still quite good. The made-from-scratch cake, though…Well that’s another story. It was AWESOME! So moist and fluffy, the perfect amount of cinnamony pumpkin, creamy cream cheese icing…Woohoo! I can make a cake from scratch! 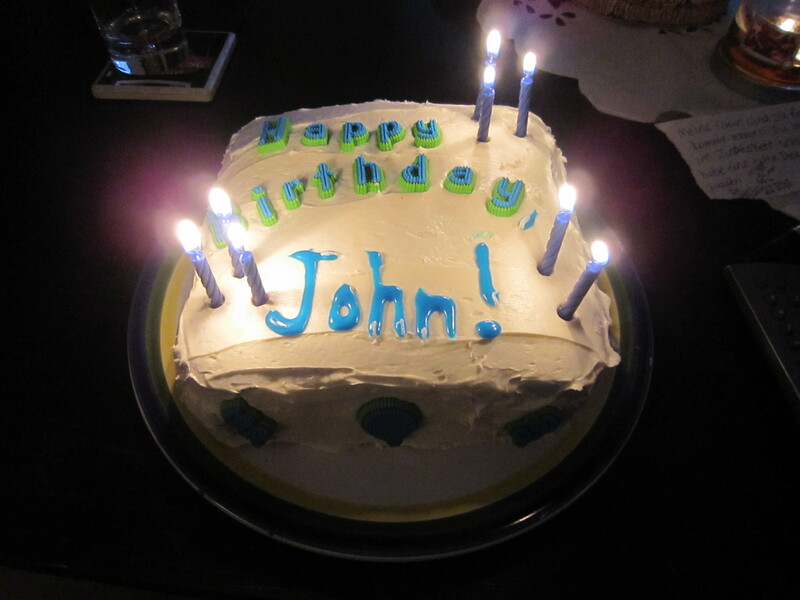 Cake #3, John's 'Real Birthday Cake.' Guess I should've just stuck to the original plan all along! I can’t wait to tell you all about our fun weekend in the Netherlands! But it will have to wait until tomorrow when I can keep my eyes open! So with a happy heart and a (very) full belly, I bid you goodnight. Oh, and Happy Birthday, my love! John brought the left over homemade cake into work and it was delicious! So glad you liked it! Hope you were able to try BOTH homemade cakes since the first one ended up being more like a slabbish pie! Ha!